The Mossberg M590 is a very versatile, powerful, light weight, combat shot gun. Soft-Air USA took all these key features and turned it into a purebred airsoft shotgun. 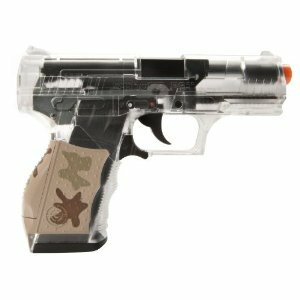 The Mossberg M590 airsoft gun comes in three different styles: Full Stock, Collapsible Stock, and Pistol Grip (seen above). It’s great to have that kind of options, and every style fits each person differently. For example, if you’re a smaller kid and still like the stock, I’d recommend the collapsible stock. If you’re looking to use for CQB (Close Quarter Battle), I’d probably buy the pistol grip version. And finally, if you were looking for a true combat shotgun to own the battlefield with and hold nothing back, I’d purchase the full stock. There’s just so many different scenarios, so just think about which one fits you best and give that a try. The Mossberg M590 is a true regulator. It shoots 355 FPS, and is pretty accurate (within five shots you can hit a squirrel from over 100 feet. I don’t recommend shooting it at any animal though, squirrels or otherwise). Obviously the pistol grip version might be less accurate though, due to it’s small format, just keep that in mind. As for different weights of BBs to use, I recommend .25 gram if you want a accurate shot, although .12 and .20 gram work fine if your goal is just to go all kamikaze on the other team. But if you’re looking to target shoot or be more conservative and accurate in a fight, I’d stick with .25 gram. One of the reasons that the Mossberg M590 is so accurate is because it boasts the BAXS system. The BAXS system is a cousin of hop-up, and claims to be more accurate. Basically with BAXS, the BB doesn’t float/sink like hop-up does. In the case of the Mossberg M590, the BAXS system works like magic. Also, the BAXS is adjustable, to give the BB less/more backspin. There are also two tricks with the Mossberg M590 that you can do. Just as a warning, though, these are called “tricks” for a reason, the Mossberg M590 isn’t suppose to be able to do this, so I’m not responsible for any damage to your gun by you trying this. The first trick is to hold down the trigger and never let it up and pump as fast as you can. That will make it virtually fully automatic. The second trick is to hold the gun so the barrel is pointing up and pump 3-5 times. Then when you shoot, it’ll shoot how ever many BBs you’ve pumped simultaneously, like buck shot. Just make sure to keep the barrel at no less than a 45 degree angle, otherwise the BBs will role out the muzzle. Like I’ve said, those are just a couple tricks you can do with the Mossberg M590 shotgun, they’re not actual features. The magazine is the only weak-link in the Mossberg M590. It only holds 12 rounds, which might seem like a lot but at the rate you can pump and shoot, you’re out in no time. Most rifles hold 20+ rounds, so the 12 rounds is defiantly a down side. But, to make up for the 12 rounds, there’s a nice big reservoir that holds 180+ rounds. The thing about the reservoir is you pull the magazine spring back past a hole that BBs fall in from and fill the chamber, just like any airsoft reservoir. The only thing about this one is that most springs can be pulled back and locked into place via notch, letting you be able to shake the magazine and get BBs into the chamber. This one however you must manually keep the spring back, because there’s no notch. When you’re shooting, and think you’ve run out of ammo, you have to hold the gun upside-down and pump for the last two or three shots. You have to do this because the magazine spring doesn’t push the last few BBs up far enough, and if you were to just take the magazine straight out, a couple BBs would fall out. This isn’t a huge deal, just remember to pump the last couple shots in upside-down. To conclude, the Mossberg M590 is a fast shooting, accurate shotgun. 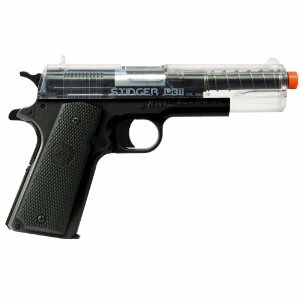 Great for both target shooting and a good backyard airsoft fight. While the magazine isn’t perfect, the power and versatility more than makes up. And it comes in many different styles, so make you get the right one to fit your needs. I definitely recommend this gun for the 20-$50 it costs (depending what style you get and where you get it from).